One clear lesson about language is that it's ever-evolving, yet at the same time, the more things change, the more things stay the same. Take the case of whom. It's a word that's been complicating things and confusing speakers and writers of the English language for ages. It's come up yet again in an Economist Language blog post in which R.L.G. asks, "Is Whom History?" This question was inspired by a 4-year-old girl correcting her mother, "Mama, sometimes you say a weird word, 'whom', when what you should be saying is 'who.' 'Whom' is not a real word." The usage to be preferred in ordinary speech and writing is "Who are you, anyways?" "Whom" should be used in the nominative case only when a note of dignity or austerity is desired. For example, if a writer is dealing with a meeting of, say, the British Cabinet, it would be better to have the Premier greet a new arrival, such as an under-secretary, with a "Whom are you, anyways?" rather than a "Who are you, anyways?" - always granted that the Premier is sincerely unaware of the man's identity. To address a person one knows by a "Whom are you?" is a mark either of incredible lapse of memory or inexcusable arrogance. "How are you?" is a much kindlier salutation. So remember, you use "whom" when you are referring to the object of a sentence. 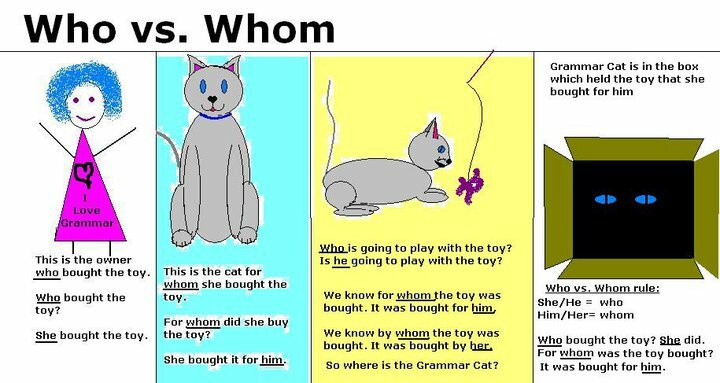 Use "who" when you are referring to the subject of a sentence.For example, it is "Whom did you step on?" if you are trying to figure out that I had squished Squiggly. Similarly, it would be "Whom do I love?" because you are asking about the object -- the target of my love. I know, it's shocking, but the Rolling Stones were being grammatically incorrect when they belted out the song "Who Do You Love?" which I think was originally written by Bo Diddley. She adds this handy tip: "If you can't remember that you use 'whom' when you are referring to the object of the sentence, just remember that 'him' equals "whom." I love him (or her) = whom do you love?, for example. Need more help? Here's an instructive chart. Thurber adds, "it is better to use whom when in doubt, and even better to re-word the statement, and leave out all the relative pronouns, except ad, ante, con, in, inter, ob, post, prae, pro, sub, and super." But even as we're coached to do it properly (and/or completely sardonically), whom-use is fading. In the Economist, R.L.G. writes that in everyday informal language use, "We leave out the relative pronoun (That's the friend I'm inviting to dinner) or just use who. Children are rarely exposed to Formal, and have little concept of register. Whom is just weird for them. A search of the Spoken category of the Corpus of Contemporary American English finds that I is about eight times more common than me—but who is 57 times more common than whom. It appears just 53 times out of every million words." Ben Zimmer added, of this search, "now that Google lets you use mathematical operators (as I described in my piece for the Atlantic tech channel) we can construct some more sophisticated queries, to see the contexts in which whom might be getting replaced by who." For example, searching for whom I like + who I like or of whom + of who. Overall, it stands to reason: Since we're all worried about using whom incorrectly, we use it less, and when we use it less, fewer of us learn how to use it properly. Should we be worried, then, that whom will someday be lost forever? R.L.G. has hope that it won't, or that we've got a while, at least, until that happens: "I think whom has a long life left in it, though, for non-grammatical reasons. Educated people prize language, and the mastery of Formal. Their status at the top of the social heap is an incentive to treat the proper use of whom as a sign of intelligence, not just the Formal register. They do most of the edited and published writing we consume. And so whom will live in print for a good long time, even as many of those same people ignore it when they're chatting at the proverbial water cooler." Essentially, Whom helps us sound smart (presuming we're doing it right) and if certain types of people (the semantical-minded, for sure) can sound smart by using a certain word, they generally will. Even as we see it less and less, it's hard to imagine revising the John Donne classic to "For Who the Bell Tolls" or that we'll start saying "To who it may concern." Maybe some whoms are destined to be forever. Or, as explained in the word's Merriam-Webster dictionary entry, "Our evidence shows that no one—English or not—should expect whom to disappear momentarily; it shows every indication of persisting quite a while yet." The other great thing about whom is that it's managed to lead to more grammar humor than, quite possibly, any other word in the English language. As Calvin Trillin once put it, "As far as I'm concerned, whom is a word that was invented to make everyone sound like a butler." Say what you will and for whom, there's something rather comforting in a word with that sort of power.